This once/week program is for young children who would like to explore the water in fun and creative ways. At each session they will learn swimming basics while also developing their creativity to help in developing future synchro skills. This is a great way for younger athletes to get introduced to the water in a fun and safe environment! Each class runs for one hour and includes 15 minutes of flexibility. Our Little Synchro coach will instruct from in the water to further aid in learning and skill development. As a once/week group, these swimmers learn all the basics of swimming and synchro while enjoying the fun aspects of ‘playing’ and ‘dancing’ in the water. They also engage in flexibility training every session to improve their range of motion. Although they don't compete they do present a small routine at our Christmas and Year-End Water Shows! 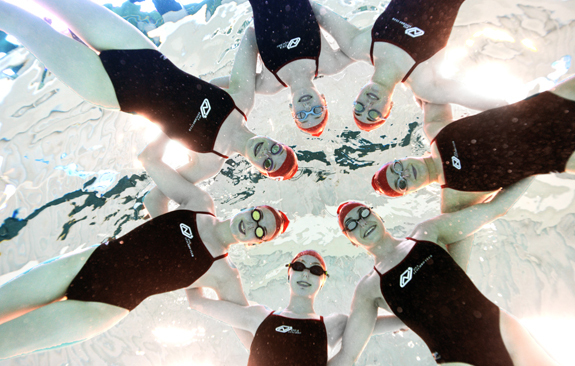 Each session runs for 1.5 hours and aligns with Synchro Canada's Aqua Squirts program. Swimmers should be comfortable swimming at least 15 meters in deep water before joining our Learn-to-Synchro program. For those who register in our Fall Session and want to continue in the Spring, our Learn to Synchro "2" class continues in teaching new skills at a more challenging level. For those who register for the first time in our Spring Session, our Learn to Synchro "1" class focuses on developing all the basics. **For more information on practice times, fees and locations click here. These swimmers train twice/week and compete at the first level of competition across the Province. They are typically still new to synchro or have one year pre-competitive or competitive experience under their belt. Swimmers in this group are introduced to three Provincial level competitions from March to May. This is a great option for swimmers who are a bit older and have no prior competitive experience. It allows them to start at a simpler level for their first year of competition before moving on to higher age groups. This group trains twice/week and also competes at three Provincial level competitions from March to May. Swimmers in these age categories enjoy competing at a higher level in 3 competitions per year within Western Canada. Competitions are a great way to expose swimmers to other clubs and routines in the province. They are high energy and offer an opportunity for swimmers to show off their positive sportsmanship! We also offer solos and duets for swimmers in the 12&U and higher age categories. These routines offer more one-on-one training, choreography development and competition experience. If your swimmer is up for more of a challenge try out an extra routine! **For more information on practice times and locations click here.